Andre Agassi, Paul McCartney, Bono, David Bowie, Tina Turner, George Clooney, Chuck Norris, and even Rihanna… Every one of them, at one time or another – and with varying degrees of intention – has succumbed to the irresistible call of the mullet. While the geometry of the iconic ’80s hairstyle has changed slightly over the years, the premise of the cut has stayed the same: business in the front, party in the back. It’s a timeless formula and thanks to the cyclical world of fashion, it’s now more on-trend than ever. 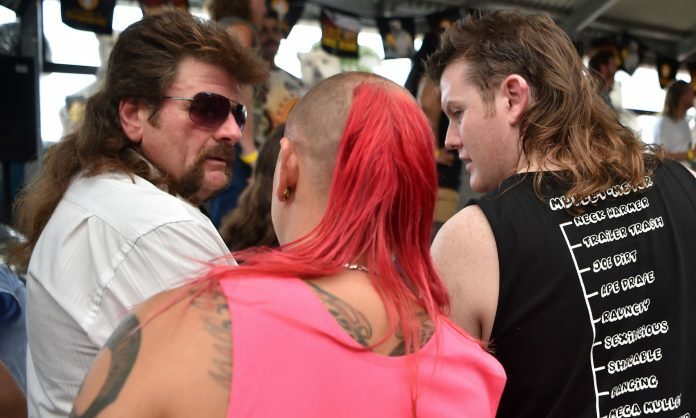 The proof was seen in the little town of Kurri Kurri, Australia, this weekend where the country’s first ever “Mulletfest” was held. For an entire day, Australia celebrated the audacious hairdo by handing out a bunch of special awards. Each prize came from a selection of five categories including best male (the winner, Shane Hanrahan, has been crafting his since 1986), best female, best junior, best Ranga (redhead) and best everyday. Scenes from the inaugural Mulletfest 2018 at the Chelmsford Hotel, Kurri Kurri NSW, Australia. Celebrating the iconic mullet. Laurie Manuele, of Victoria cooling his mullet with a portable air conditioning unit, Bronson North-Batcheldor after purchasing a case of beer, Madeleine Moist & Zac Ralph getting their groove on to The Stunned Mullets band. Portraits of Dave Charlton, King Jay, Laurie Manuele, Zac Ralph, Howard Halpin all entrants at the inaugural Mulletfest 2018 at the Chelmsford Hotel, Kurri Kurri NSW, Australia. A day of celebrations of the iconic haircut.